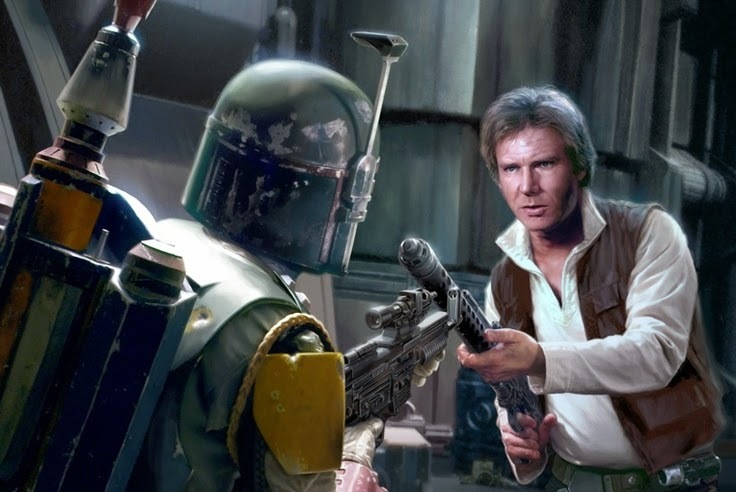 "When we thought that we were looking at a Han Solo or a Boba fett spin-off film first, we got a little bird singing in our ear telling us that we had it all wrong: both these characters are in the same movie." This is very interesting and sounds plausible. We've discussed before how miscommunication among inside sources could lead to skewed reports for us. We've been hearing about Han Solo and Boba Fett films for literally years now, and I'm inclined to believe there's at least some truth to these reports. It's understandable that someone would jump to the conclusion that only one character would be the focus for each film, in a similar way Marvel has single character focused films such as Iron Man and Captain America. But given Star Wars' history of ensemble casts, it seems more likely that the Star Wars stand alones will feature an array of characters at the forefront. As always, this is merely rumor and speculation and should be taken with a grain of salt. All will be revealed when the first stand alone film hits theaters December 16th, 2016! I think it's auite plausible that they've got history. Especially from the way Han yells "BOBA FETT!! WHERE?!" while fighting on Jabba's skiff & recovering from hibernation sickness. I'd still love to see an Obi-Wan Kenobi movie set during his years of exile on Tatooine. As much as this would be awesome; I don't think it will happen since I doubt they could cast a young Han Solo. Ford is too old to play a young Solo and I can't imagine a recast. The role of Han Solo is too iconic for someone else to play; it would be a huge risk for any studios involved.